SCVHistory.com HS8801 | Heritage Junction | Blueprint: Edison House Relocation Site Plan, 1988. 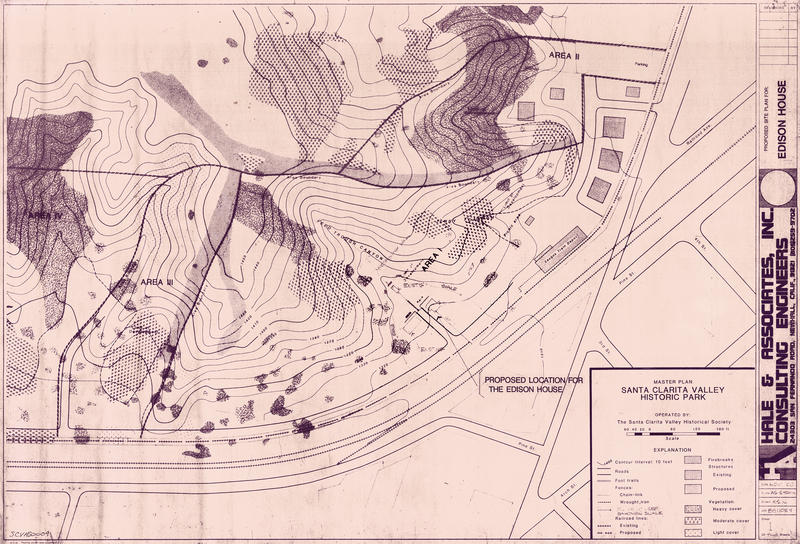 1988 site plan for the 1989 relocation of the Edison House from the "Edison Curve" on Magic Mountain Parkway (aka Route 126 at the time) to the "Quester Court" section of Heritage Junction Historic Park, inside William S. Hart Regional Park in Newhall. Blueprint shows the previously existing Kingsburry House and Ramona Chapel, both of which were moved to Quester Court in 1987. Blueprint by Hale & Associates Inc. Consulting Engineers (Don Hale) of Newhall, November 1988. Edison House at Heritage Junction Historic Park, Newhall. Photo ©Jessica Boyer 2016. Click to enlarge. The Edison house at Heritage Junction was once part of a group of cottages built in 1919 by the Southern California Edison Company to house employees when the Newhall substation opened. The house was moved west of Saugus in 1925 when the "new" substation was completed and five other homes were built of identical design. Assistant Edison Patrolman Raymond Starbard occupied it and was credited as being the first to spread the alarm of the 1928 St. Francis Dam disaster. The cottages were sold to The Newhall Land and Farming Company on January 17, 1972. 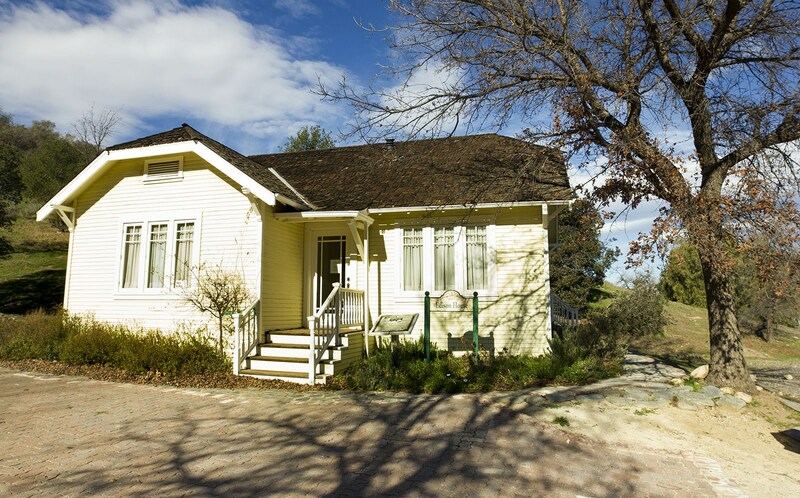 The cottage was donated to the Santa Clarita Valley Historical Society and moved to Heritage Junction on January 18, 1989. The other houses were burned by the Los Angeles County Fire Department as a training exercise. Architecturally significant not only for its Swiss-Germanic Style, but also for being unmodified, this single-family residence has a shingled, gabled roof, clapboard siding, and hardwood floors. HS8801: PDF and 9600 dpi jpegs from original blueprint, Santa Clarita Valley Historical Society files.